Creative Ideas - borrowed, copied and of course improvised !!! /hihi I know its quite long I have not updated anything. I am just back from my native place and so much has happened in past few weeks. During this cricket madness of IPL, I was fortunate to get the remote control and by chance I noticed a show on TV, where they were telling the procedure to create wall hangings from bread pieces. I thought of giving it a try immediately after reaching Bangalore, although my husband was against me doing these kind of activities. He argues that I'll lose focus from my animation work as I have too many assignments to complete. But what to do, I can't give-up my interests so easily. I want to learn pottery designing as well as murals, not possible in near future due to time constraints !! I just tried it in a hurry, you can consider it as a trial run although it gave some confidence to me. Here is the procedure for the interested people. 1. Remove the crusts from the bread slices. If the bread is fresh and soft, dry them under sunshine for half an hour to remove moisture. 2. Use a food processor to form fine crumbs. 3. Prepare a dough (similar to roti dough) by adding white glue, acrylic color to the bread crumbs. Knead the mixture until it forms a pliable clay. If you want more than one color you need to make separate batches of dough. 4. Now flatten the dough using rolling pin and make flowers, leaves and other ingredients for your work. 5. 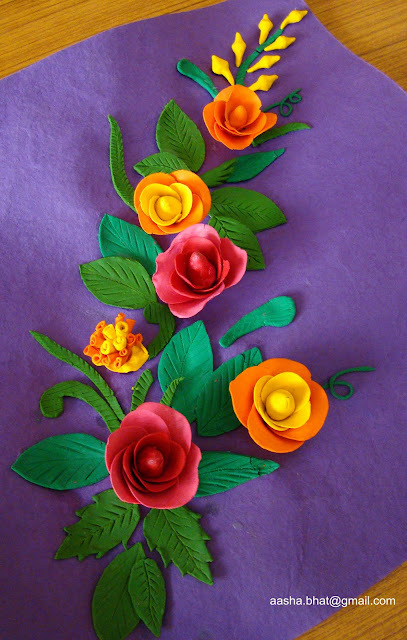 Use varieties of bottle caps (for petals), knife (for leaves) and your fingers to give proper shapes required for the work. 6. Attach the flowers, leaves, petals etc to the base using white glue. You can apply wood varnish after they are completely dry to protect the bread flowers and makes them last longer. I did not think of writing a blog for this work, so I don't have the step-by-step photos. Aaahh, its kind of buy one get one free :) Along with the bread flower, I'll be sharing with you on how to make Golden Tree. 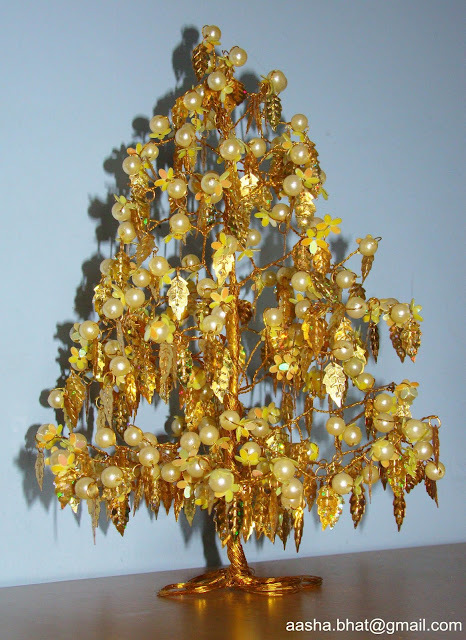 Don't worry, its Golden Tree without using Gold and is not that costly too!! I did this few months back, neighboring aunty was kind enough to teach me this. It is easy to make and looks really nice. 1. Fold the golden wires of equal length (around 30-40) into half and twist it in the bottom so that you will get branches and stem. 3. Spread the branches equally and in each branch twist beads, leaves and flowers alternatively. 4. Repeat the same method for all the remaining branches. 5. Now divide the bottom into 4 equal parts and twist them and make it look like the tree stand. You can enjoy the pain in thumb and forefinger thanks to twisting the wires for a day or so, along with the satisfaction you get ! !